The Solar Impulse airplane flew from Japan to Hawaii with no fuel; at least, no fuel in the conventional sense. Instead, the aircraft gathered solar energy with its massive wings to make the record-breaking 7,200 kms (~4,500 miles) flight. From a pure engineering perspective, a solar aircraft makes no sense. 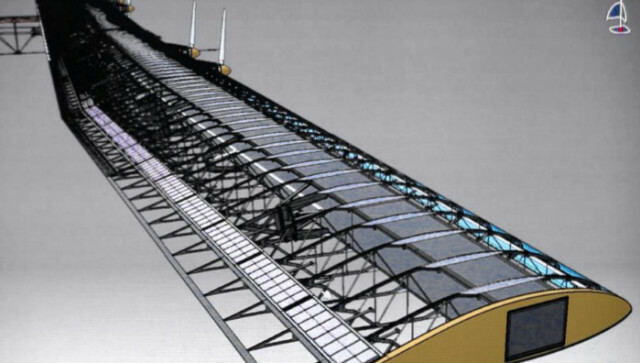 How can solar energy lift the weight of an aircraft? How is it possible to fly overnight when there is no sun for power? Pilot and CEO Andre Borschberg and head of airplane development Robert Fraefel shared a few of their engineering secrets. Though in reality, Fraefel and Borschberg aren’t sharing “secrets”. Instead, they are sharing information that can help engineers design more sustainable products. The goal of the audacious Solar Impulse project is helping engineers and the rest of the world understand solar energy’s potential. The Solar Impulse team started 2015 with a specific goal: to fly around the world in a solar powered aircraft. While that initial objective is still incomplete, the team set a number of records, including the impressive Japan to Hawaii flight. That flight set a new record for the longest solo unrefuelled trip at 118 hours in the air. To stay in the pilot’s seat for over four days straight, Andre Borschberg said he managed on a series of 20 minute naps. Collecting solar energy requires a lot of surface area. To address that requirement, the Solar Impulse aircraft is big. Really big. 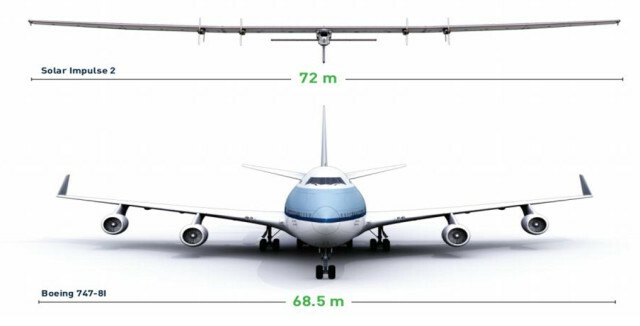 The wingspan is wider than that of a Boeing 747, and is covered with approximately 17,300 solar panels. The solar cells operate at approximately 22 - 23% efficiency, according to Borschberg. He pointed out that these are commercially available Silicon-based cells, not something new from a research lab. He went on to say that if his team were to design a next generation Solar Impulse, they would take advantage of Gallium based cells that achieve efficiencies in the range of 28 – 29%. The solar energy collected on the wings powers four 17.4 HP electric motors. The Solar Impulse team claims that the entire energy cycle is 94% efficient, due partly to the proximity of the energy collection system to the motors and partly to the highly efficient brushless electric motors. This extreme efficiency comes at a cost in terms of performance. The aircraft has a maximum speed of only 85 mph and typically flies much slower to conserve energy. During daytime flight, Solar Impulse collects more energy than it needs, and stores it in two ways. The first way is in the form of potential energy. The aircraft climbs to an altitude of up to 28,000 ft. during the day, and then glides down to as low as 4,000 ft. overnight. 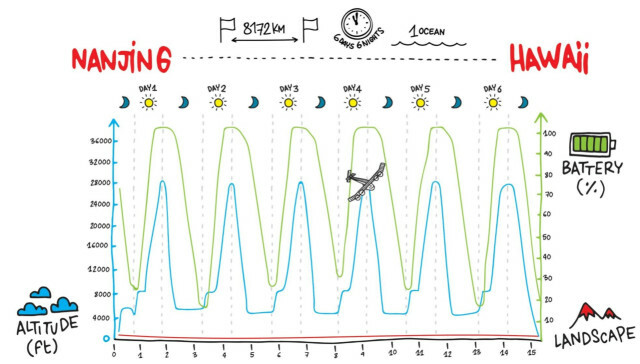 The following chart depicts the flight from Japan to Hawaii. The second way the team stored the collected solar energy was with four Lithium polymer batteries mounted underwing. These batteries were engineered to have an impressive storage efficiency of 260 Wh/kg. However, the batteries proved to be the team’s undoing when they overheated and were deemed unsafe for further travel. Solar Impulse is currently stranded in Hawaii waiting for new batteries so that it can continue its world tour in 2016. An empty Boeing 747 can weigh in at 670,000 lbs at take-off. Solar Impulse weighs only around 5,000 lbs. It has a similar wingspan, yet weighs less than 1/100th as much. The team accomplished this lightweightingdespite having to lug around four large batteries which together weigh over 1,250 lbs, more than 25% of the aircraft’s total weight. The engineers came up with a combination of light materials in the form of an alveolate foam sandwiched between layers of carbon fibre. This material makes up the fuselage, cockpit and spars. The wings have 140 carbon fiber ribs spaced 50 cm (19”) apart. The team was sponsored in part by Dassault Systèmes, and used their 3D EXPERIENCE product design platform for the design process. The Solar Impulse project’s aim is to highlight the potential uses for solar energy, rather than demonstrating a new future for aviation. Solar still suffers too many constraints to make it a competitive power source for commercial aircraft. The obvious shortcomings include that the aircraft holds only one person, the pilot, and flies far too slowly for realistic long distance travel. And of course, the Solar Impulse is highly sensitive to weather. The team had to wait for more than three weeks in Japan before the right forecast gave them the confidence to leave for Hawaii. Not only does the forecast have to be sunny, the plane also is sensitive to rough weather. For example, the plane suffered a broken aileron and had to divert in a previous flight. None of these constraints diminish the accomplishments of this team of engineers. They worked within the constraints of solar technology and pushed the boundaries of lightweighting to show that there are ways to use solar energy, achieving what many might consider impossible.